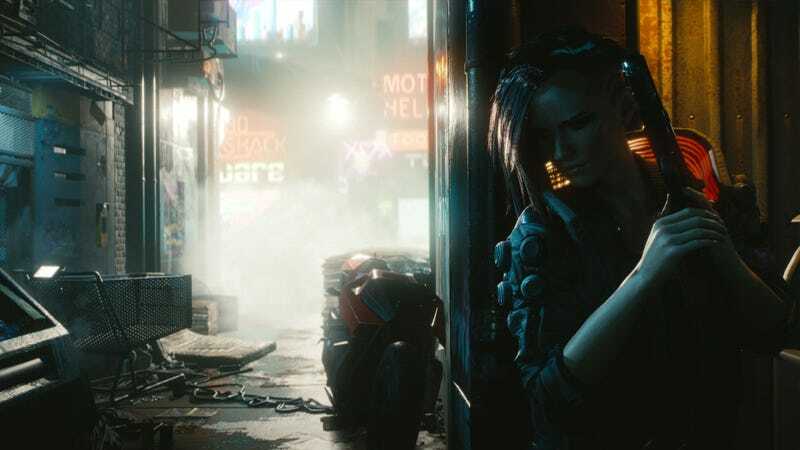 We got a peek at Cyberpunk 2077 during Microsoft’s E3 press conference, but other than verifying that the cyberpunk setting will, in fact, have mohawks and buildings that appear to have been smuggled out of Blade Runner while nobody was looking, we didn’t actually learn much. Today, CD Projekt divulged some real details. The open-world role-playing game will take place mostly in first-person—as opposed to The Witcher 3's third-person point of view, which was designed specifically so that you could undress Geralt with your eyes whenever you wanted. However, you’ll still get to see your character during conversations and cut-scenes, so it’s more than just a first-person experience. You’ll play as a character named V, who CDP describes in a press release as “a hired gun on the rise in Night City, the most violent and dangerous metropolis of the corporate-ruled future.” You’ll be able to choose V’s gender, appearance, class, and historical background. Any of those things can influence the “shape of the game,” CDP wrote. V will have access to multiple options in many scenarios, from violence to hacking to engineering. RPG elements are also present in combat, with damage numbers popping off enemies à la Destiny or Borderlands. There are also combat abilities that allow you to do things like slow down time, according to IGN. And of course, you can drive, something you probably already surmised given that the game’s most prominent piece of art so far is a dude leaning against a car. Stats will have interesting impacts outside of combat, as well. For example, there’s a street cred stat that lets you open up even more of the open world. A certain jacket might raise the stat a few percentage points, granting you access to new areas or conversations. Oh, and there’s a “cool” stat, but PC Gamer, who noticed it, isn’t clear on what exactly it does. Personally, I hope that when you max it out, it turns you into Geralt.